"I find this book to be inspirational — curiosity and gentleness of spirit forming genius." "Michael Pollan is a sensualist and a wonderful, funny storyteller. He is so engaging that his profound environmental messages are effortlessly communicated. He makes you fall in love with Nature." 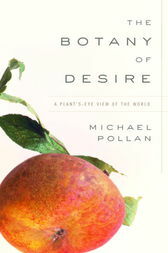 "A fascinating and disturbing account of man's strange relationship with plants and plant science. Michael Pollan inspires one to rethink basic attitudes. Beautifully written, it is as compelling as a detective thriller." "Like Tracy Kidder, Michael Pollan is a writer to immerse in. He's informed and amusing, with a natural sort of voice that spools on inventively beyond expectations into a controlled but productive and intriguing obsessiveness (whether on Johnny Appleseed or marijuana). A fine book." "Anyone who has ever made personal contact with an apple, spud, tulip, or marijuana bud should read this book and be astonished at the eternal tango of men and plants, choreographed with wit, daring, and humanity by this botanist of desire who knows equally the power of plants and of words." "Not since Jonathan Weiner's The Beak of the Finch have I been held so spellbound by a book. Using only four plants, The Botany of Desire succeeds in illuminating the radiant force of evolution. Remarkable." "It is a rare pleasure to read a book of ideas so graceful and witty that it makes you smile—at times even laugh out loud—with delight as it challenges you to rethink important issues."